I adored the first book—finally, a Young Adult novel I was really hyped up for that didn’t disappoint me—but this sequel was even better. I think it’s safe to say if you enjoyed The Valiant, then The Defiant will continue to impress. Warning: possible spoilers for the first book if you haven’t read it yet! Our series protagonist, Fallon, has gone from Celtic princess to captured slave to Rome’s most beloved gladiatrix, but now she’s about to learn that fame comes with a price. Following the events of The Valiant, Fallon is looking forward to spending some time with her sister Sorcha, with whom she was recently reunited. Their gladiator academy is also flourishing, having gained the favor of Caesar as well as the Egyptian queen Cleopatra. But those Fallon has wronged have not forgotten nor forgiven the way she humiliated them. Bent on revenge, a rival school is about to threaten everything Fallon fought so hard to gain, including the autonomy she has won for herself and her fellow gladiatrices. Then there’s Cai, the Roman soldier she fell in love with, who is pulled into the conflict as Fallon and her friends are forced to make a desperate escape from their home in the middle of the night. With Sorcha missing and everyone fearing the worst, Fallon’s only hope now lies in locating a lost tribe of warrior women said to be descended from the mythical Amazons. The Defiant was an addictive read. Lesley Livingston once again shows her talent for engaging storytelling as she brings this series to a whole new level, delivering fast-paced action and nonstop entertainment. Old foes return and new alliances are forged in this sequel, which also focuses on exploring the relationships between characters we’ve come to know and love. In addition, the story addresses some of the questions we were left with at the end of The Valiant: what exactly was the dark ritual Fallon witnessed, and how deep does the corruption go? I loved what this book did for the main protagonist, showing us once more what a talented leader and fighter she is. Fallon also comes across as genuinely capable and motivated, and she has this no-nonsense approach that I find really refreshing. This attitude extended to the romance between her and Cai, which had the appropriate amount of tension without going overboard with the melodrama. It certainly didn’t distract from the main storyline, which the author has packed with plenty of action and intrigue. The Defiant also brings interesting new developments to the overall series, and compared to the first book, this sequel does feel quite a bit meatier in terms of substance. It’s as if all the elements that worked in The Valiant were honed, polished, and made even better. There were also improvements aplenty, from more detailed world-building and character development to cleaner prose and writing. Livingston has been working hard at her craft, and it shows. As a reader, it’s always a joy to find a sequel which surpasses its predecessor, especially when I already love the first book so much. It’s rare enough, especially in YA fiction, that I didn’t dare get my hopes up, approaching The Defiant with realistic expectations, not knowing that the book would ultimately exceed all of them. With luck, the trend will continue into the third installment, which I’m already looking forward to with much excitement. Audiobook Comments: I just had to go with the audio edition for this one, considering the amazing time I had with the audiobook of The Valiant. Fiona Hardingham returns for the narration, and she was once again brilliant in her role as Fallon. Her wonderful accents, intonations, and impeccable sense of timing are all reasons why she’s one of my favorite narrators, and why I wouldn’t hesitate to recommend this series in audio. Yes, I remember how the first book failed to draw you in. I do have to say though, The Valiant very “YA”, so I can see how that could turn readers off! The series has matured quite a bit in The Defiant! Haha, yeah I think I remember someone else bringing that up when I reviewed the first book last year. But there’s no relation, Michael Livingston is an American college professor, and Lesley Livingston is Canadian I believe! Yes, the cover is stunning! Love the purples. I so need to read this. I’ve had The Valiant rec’d to me a few times, but haven’t gotten to it yet. Knowing that this one is as good or even better will motivate me to read it soon though! I didn’t read your review, just checked out your star rating because I’m most of the way through this one (should finish this weekend). Absolutely loving it so far, so excited it must finish well and keep you happy since you gave it full 5 stars! I’m glad! I can’t wait to hear what you think when you’re finished! 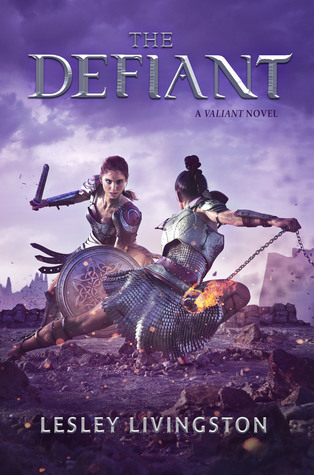 I loved The Valiant and can’t wait to start reading The Defiant! I got an ARC a few months ago but haven’t dived in yet – when I heard that the series would be continued as a trilogy, I took a bit of a step back. I will definitely be reading The Defiant soon though. 😀 Excellent review, Mogsy! Nice! I hope you get a chance to read it soon! And I hope you’ll love it! Eeeeee yay! I’m so glad to hear that the sequel surpasses the first book, because while I enjoyed The Valiant I wasn’t too sure about continuing the series. Now it looks like I need to! Fallon really is a very likeable heroine. I hope you will enjoy this sequel if you decide to continue! I forget, did you also listen to the first one in audio? Sweet, I hope you’ll enjoy it too! Well, I’m hesitant to add more books to my tbr at the moment but even so this one will have to go on the list. I must read it.